Innovation is often thought as an outcome; however, the innovation process, or how innovations are developed and implemented over time[i], has tended to be and still largely is a ‘black box’, whose complex internal workings are poorly understood[ii]. This knowledge gap is especially acute in tourism. Theories and models, especially from the 80s based on manufacturing and studying successful intrapreneurs within major corporations have traditionally given an oversimplified image of the innovation process as linear and formed by a predictable sequence of stages[iii] [iv]. According to Schroeder et al. (1986)1, stage models were too simplistic to explain complex innovation processes and subsequent literature would characterize the innovation process as inherently dynamic[v], uncertain[vi], random and slightly chaotic[vii] [viii] with unpredictable delays and setbacks. During the innovation journey, entrepreneurs engage in a sequence of events that transform a new idea into an implemented reality4. According to Kanter[ix], these broadly correspond to the unfolding innovation process: idea generation, coalition building, idea realization and transfer or diffusion. The time-order of the tasks described below, however, is non-linear. Innovation begins with entrepreneurs who sense a new opportunity which is then repeatedly evaluated engaging with informed individuals, doing a preliminary market testing or financial viability analysis, etc. This task involves power acquisition by bringing potential allies into the process. The sources of power can consist of knowledge, finance, time and space resources, or support in the form of backing or approval. This task involves turning the idea into something tangible, such as a prototype. There are also critical organizational challenges. In start-ups, this task not only gives rise to the innovation but also the entire business. The innovation process culminates with the commercialization or the adoption of the innovation by users. Customer adoption will determine the success or failure of the innovations. Rodriguez et al. (2017) have studied the innovation process of a sample of tourism entrepreneurs and the finding both confirm and challenge existing ideas about the innovation process in the field of tourism. The innovation process in tourism is especially dynamic and agile with customer interaction being integral[x]. The study empirically provides confirmation that the process does not follow the linear stages of existing traditional models which describe innovation in already established manufacturing firms (e.g. Stage Model of Cooper or Kanter’s model). 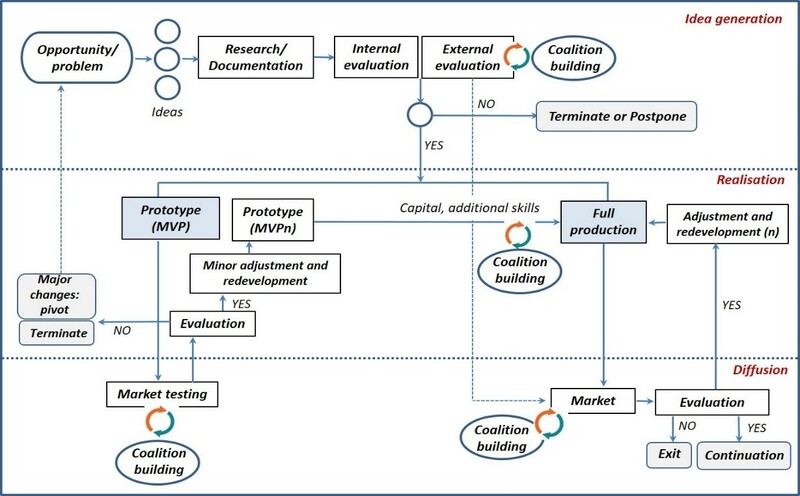 The start-up process analyzed has more agile dynamics in which a product or service – even if not necessarily fully developed – is quickly and constantly evaluated and adapted to the market (see Figure 1 below). Knowledge is not incorporated through deep formal initial research but progressively through experimentation. This Doing, Using and Interacting experienced-based mode of learning[xi] has also been noted by Nordin and Hjalager[xii] in their Icehotel innovation case study and seems to be appropriate to the tourism sector. User-driven and agile innovation approaches or methods which have gained progressive importance (e.g. Lean Startup) are inspiring new practices which require rethinking existing frameworks especially when dealing with more innovative projects[xiii]. To accelerate the process, many activities overlap rather than forming a neat, orderly sequence. This is especially evident in the constant evaluation and coalition building over time with different key stakeholders. Evaluation is critical to guiding this process, with learning and flexible modification of the existing path. This work also challenges some assumptions. For example, Kanter (1983, 1988) considered that coalition building was the second task of the process however in the tourism sample analyzed this was a transversal and continuous task throughout the journey. The heterogeneity and the contingent nature of the innovation process mean that caution is required with respect to generalization and extrapolation of this study’s findings: the results are context-dependent, and the sample selection involves specific types of entrepreneurs and innovations, and is tied to the development of a start-up. The innovation process is also affected by the context (cultural, political and institutional) and might differ in other tourism innovation journeys (e.g. less technological forms of innovation, more complex, R&D intensive and higher risk projects), and this need to be analyzed. [i] Schroeder, R., Van de Ven, A., Scudder, G., & Polley, D. (1986). Managing innovation and change processes: findings from the Minnesota Innovation Research Programme. Agribusiness, 2(4), 501-523. [iv] Van de Ven, A., Polley, D., Garud, R., & Venkataraman, S. (1999). The innovation journey. New York: Oxford University Press. [v] Kline, S. J., & Rosenberg, H. (1986). An overview of innovation. In R. Landau & R. Rosenberg (Eds. ), The positive Sum Game (pp. 275-305). Washington DC: National Academy Press. [vi] Kanter, R. M. (1983). The Change Masters. London: Unwin. [xii] Nordin, S., & Hjalager, A. (2017). Doing, Using, Interacting: Towards a New Understanding of Tourism Innovation Processes. In A. Kiráľová (Ed. ), Driving Tourism through Creative Destinations and Activities (pp. 165-180). Hershey, PA: IGI Global.